The Los Angeles Lakers have a decision on their hands before the NBA trade deadline, and it’s one of the biggest choices they have left to make this season: Should the front office trade Julius Randle, or risk losing him for nothing in restricted free agency this summer? There are both short-term and long-term implications for either choice, but in watching Randle and the team play this season as well as reading the free agency tea leaves, it seems clear that holding onto Randle (for now) is the wisest choice the Lakers can make. First, some context. The latest report paints it as unlikely other NBA teams will part with anything of significance for Randle, preferring to sign him for nothing more than a lucrative contract in free agency. And unless that reading is wrong and the Lakers could actually get something significant — like a high first-round pick or promising young player — for Randle, then he’s worth keeping in both the immediate future and (potentially) in the long run. Trading Randle for future assets would hurt the Lakers right away in a few ways. 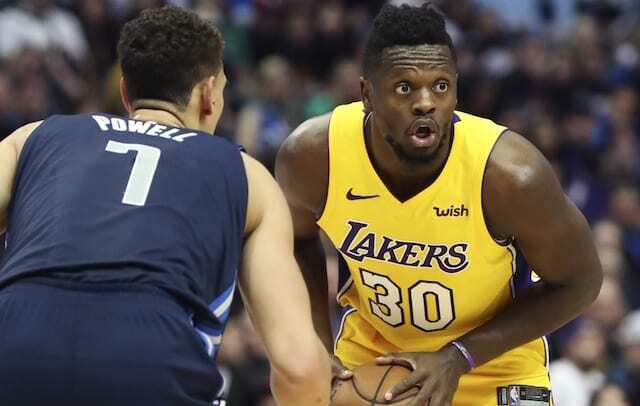 For one, no one on the team is capable of playing the specific type of defense that Randle can, the type of defense that led Lakers head coach Luke Walton to call him one of the best bigs in the entire NBA at switching to guard all five positions. Randle is far from a flawless defender, but there are zero players on the current roster that can do the exact things he does defensively. If the Lakers were to lose him without getting back a player who could contribute on the same level right away, the team would be worse off on defense as well as on the other end of the floor for similar reasons. Randle can be a bull in a China shop offensively in both positive and negative ways. Sometimes it leads to turnovers, and sometimes he can have tunnel vision, but similarly to his impact on defense, there are no other Lakers who can do exactly what Randle does offensively. Not only is Randle one of the team’s only players capable of consistently creating a shot for himself, but more crucially, he’s also one of even fewer capable of getting a good shot for others. Randle does this with both “Kobe Assists” by drawing help on his aggressive forays to the basket that create offensive rebounding opportunities and with actual ones. Randle might only average two assists per game, but that still ranks fifth among consistent rotation players on the sometimes pass-allergic Lakers and need all the playmaking they can get. Plus, between the two types of opportunities Randle creates, he helps the team shoot more efficiently, as evidenced by the Lakers’ effective field-goal percentage never being lower than when Randle sits on the bench. Now, some might ask why any of this matters. The Lakers aren’t going to make the playoffs this season, so how much does getting rid of Randle really hurt the team when they aren’t going to be playing postseason basketball either way? That’s where the long-term implications of trading Randle come in. If the team moves Randle for little-to-no immediate return, their non-playoff record would end up looking even worse down the second half of the season, lending credence to the negative perception of the Lakers, paining them as laughably bad once again. It doesn’t matter whether or not Randle stays past that in some ways, the team just needs to be able to show a positive record and good vibes about the team when they begin pitching free agents. Whether the player who helped compile them is still there or not is immaterial, it’s an issue of the way the team is viewed, not the way it exists. The possibility of Randle being on the team can’t be dismissed either. Though, there are a few ways it could happen. Obviously, the Lakers’ pipe-dream plan is to sign two max-free agents, which would in all likelihood necessitate letting Randle go, but them doing so is far from a certainty. Should they whiff on the likes of LeBron James, Paul George, DeMarcus Cousins and others, rolling things back with Randle is one of the better contingency plans the team could flip to given that he’ll still be one of the best free agents on the market this July. The Lakers might not even miss entirely. Should the team “only” manage to wrangle, say, Paul George, then keeping Randle to run alongside him and the rest of the young core as the Lakers try to gun for a postseason spot is a better option than not retaining a player of his talent level. All of those options are off the table if the Lakers trade Randle now for a token return simply out of fear of losing him for nothing. 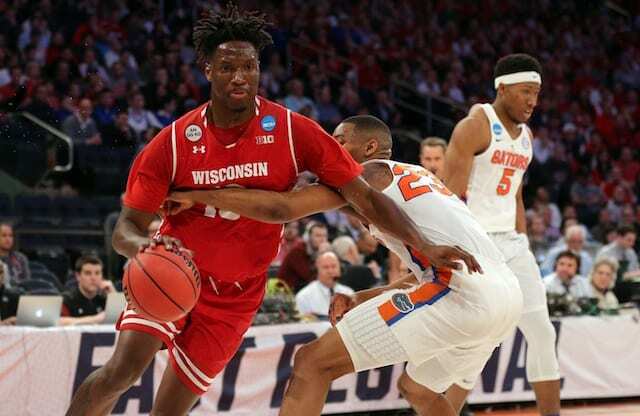 While them losing a former lottery pick for no return would be painful, the benefits of keeping Randle and rolling the dice on that worst case scenario still outweigh the small benefits of being able to say they got something small back for him at the deadline.